Kevin Bowers' new album, Nova, is a merge of Brazilian samba, psychedelic rock, romantic compositions, and lyrics full of visual imagery; all giving the feeling of being transported to a better and exciting place. Now, for a reality check: the film was never made but if there was a movie, this would be the soundtrack. When St. Louis- based drummer/composer, Kevin Bowers, went on a deep and deepening trip through Spain, he also went on an epiphanic creative journey. 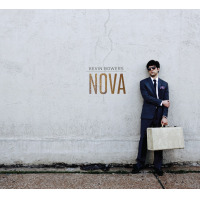 He’s returned with Nova (to be released August 9th) a tropical, trippy and rocking album with a surprise smattering of Bossa Nova influenced by the great Jorge Ben and Gilberto Gil.